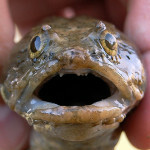 First of all, Toadfish is the common name for a variety of species from several different families of fish, usually because of their toad-like appearance. 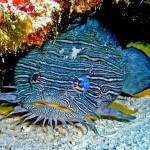 Fish in this family are usually called toadfish: both the English common name and scientific name refer to their toad-like appearance (batrakhos is Greek for frog). 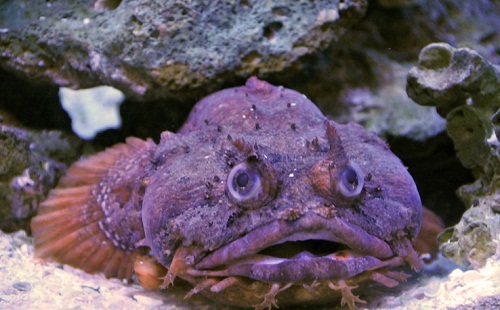 Toadfish are benthic ambush predators that favor sandy or muddy substrates where their cryptic coloration helps them avoid detection by their prey. 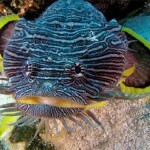 Toadfish are well known for their ability to “sing”, males in particular using the swim bladder as a sound-production device used to attract mates. 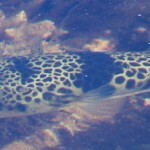 Toadfishes are bottom-dwellers, ranging from near shore areas to deep waters. 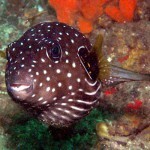 Toadfishes are bottom-dwellers, ranging from near shore areas to deep waters. 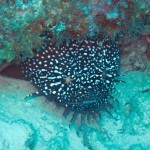 They tend to be omnivorous, eating sea worms, crustaceans, mollusks and other fish. They often hide in rock crevices, among the bottom vegetation, or even dig dens in the bottom sediments, from which they ambush their prey. 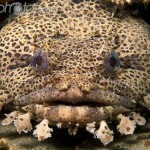 Toadfish can survive out of water for as much as 24 hours, and some can move across exposed mudflats at low tide using their fins. 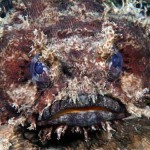 Leopard toadfish (Opsanus pardus) on a seabed. 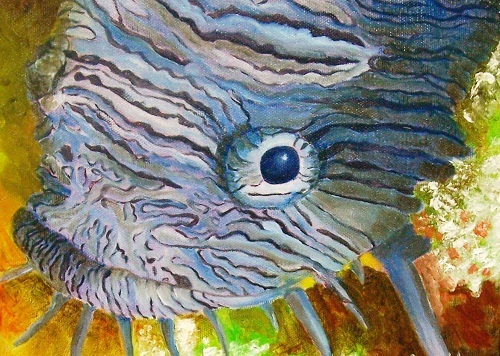 This bottom-dwelling predatory fish conceals itself on sand on the seafloor where it lies in wait to ambush its prey. 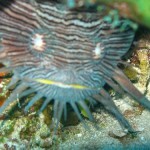 The species inhabits waters along the Florida panhandle and the western coast of the Florida peninsula at depths greater than fifteen meters. Photographed at a shipwreck in the Gulf of Mexico, off San Pablo island, Florida, USA.